Arrival at Delhi. Meeting and assistance upon arrival in Delhi and transfer to your hotel. After wash and change we proceed on a half day tour of Delhi. Today we will visit Old Delhi covering Jama Masjid, Red Fort and Chandni Chowk. Stay overnight at the city hotel. This morning we proceed on a sightseeing tour of the other part of the city, New Delhi and visit the Laxmi Narayan Temple, India Gate, and the Gandhi Memorial. Also visit embassies and the Parliament House (from outside), Humayun's Tomb and the Qutab Minar. Following the tour we will begin our road journey towards Jaipur. Upon arrival, transfer to the hotel. Night halt at Jaipur. After breakfast begin your road journey towards Agra, on the way we visit the deserted city of Fatehpur Sikri. This Mughal city, established by Akbar, has been declared as the world heritage site. After exploring Fatehpur Sikri and visiting its monuments. From here we continue driving to Agra. After reaching, get transferred to the hotel. The rest of the day is free. Overnight stay in the Hotel. Afternoon we will visit Agra Fort and Id-Mat-Ud-Dauhla's tomb. Meeting and assistance upon arrival at Varanasi train station and check-in at the hotel. 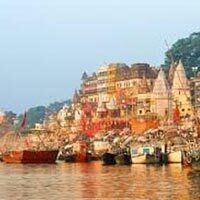 After wash & change we will enjoy a day-trip to Sarnath, a religious Buddhist site.In the afternoon city tour of Varanasi covering - Alamgir Mosque or Beni Madhav Ka Darera, Dasaswamedh Ghat and The Bharat Mata Temple. 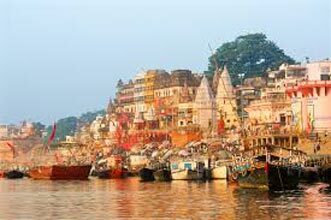 Today early morning we enjoy a boat ride on river Ganges. Following breakfast, transfer to the airport for your flight to Delhi. Upon arrival, Meeting and assistance to the city's International airport for your onward flight back home.